Shakespeare in Love (1998): Dir. John Madden. Written by: Marc Norman and Tom Stoppard. Starring: Joseph Fiennes, Gwyneth Paltrow, Geoffrey Rush, Colin Firth, and Judi Dench. Rated R for sexuality. Running time: 123 minutes. “It beat out Saving Private Ryan!” has been the opinion of many critics—a moot point considering the highly divergent subject matter. The loosely factual, heavily-fictionalized account of the Bard’s love affair won over literary nerds and groundlings alike. It’s 1593 and William Shakespeare has a major case of writer’s block. That all changes when he comes across Viola de Lesseps, a young noblewoman who risks foul consequences to audition (in male clothing and moustache, no less) for Shakespeare’s new play, which will eventually become Romeo and Juliet. Art begins to imitate life as their romance transfers to the page. But the pair runs into obstacles when Viola is betrothed to the incredibly bland Lord Wessex. After the multitude of self-serious romances we’ve seen this decade, it’s great to find one played as a mad-cap farce. The manic energy recalls Shakespeare’s comedies as well as early twentieth-century screwball films. And despite the impeccable costume design and period detail, it certainly loves lampooning Hollywood culture as well as Elizabethan England. We have co-screenwriter (and perennial playwright) Tom Stoppard to thank for the script’s tongue-in-cheek jokery. It’s a shame that the “in love” component of the film’s title stands out as the weakest component of an otherwise witty romp. Not to say that Joseph Fiennes as Shakespeare and Gwyneth Paltrow lack chemistry or passion together—they exude those qualities in spades–but that there’s a stagnancy to it. In fairness, there was stagnancy to the affair between Romeo and Juliet, but it also makes the more intimate scenes between the pair feel superfluous. Still, director Madden plays their climactic love scene with touching poignancy. 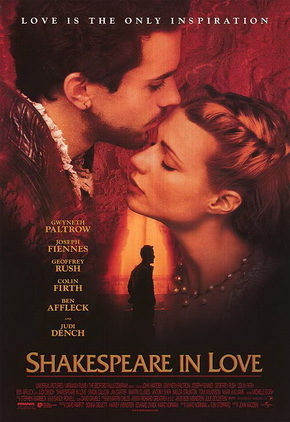 Shakespeare in Love never reaches the giddy heights of Shakespeare’s romantic comedies, and I may have preferred some kookier choices from the director to match the witty script. Still, there’s a charm and sophistication to this highly-stylized tale that enlivens what could have been another stodgy period piece.